Roman Reigns has been positioned as one of the top WWE Superstars ever since he made his debut as a member of The Shield in late 2012, so it’s only natural that his pinfall defeats have been restricted to very rare occasions. Following his recent surprise loss on the 25 June episode of Monday Night Raw, where he was pinned by The Revival’s Dash Wilder in a tag match with Bobby Lashley, we figured we should look into how many times “The Big Dog” has been pinned for the 1-2-3 in his WWE career. The answer? Fiftee times, which sounds like a high number for a four-time WrestleMania main-eventer but it isn’t all that surprising when you consider that he is close to completing his sixth consecutive year as a main-roster performer. These match statistics, obtained from wrestling database site profightdb.com, also show that only six people have recorded pinfall victories over the Shield member on more than one occasion, while it took over two years before he finally lost a singles match via pinfall. So, who are these 15 lucky people who WWE has entrusted with a 1-2-3 televised victory over arguably their biggest Superstar? Without any further ado, let’s take a look at who made the list and how they got the win. Roman Reigns’ first televised pinfall defeat came almost a year after he first appeared on our screens with Dean Ambrose and Seth Rollins. 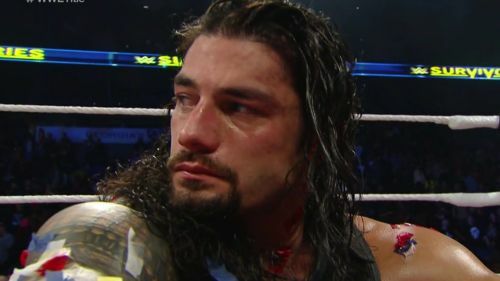 During an 11-on-3 handicap match on Monday Night Raw, “The Big Dog” withstood punishment for several minutes from Daniel Bryan before Jey Uso connected with a top-rope splash to eliminate his cousin. The match eventually came down to Bryan and Seth Rollins, with “The Leader of the Yes Movement” picking up the win for his 11-man team after following up a diving headbutt with his trademark running knee. Competing in a Tag Team Championship match on Raw against Cody Rhodes and Goldust in October 2013, Reigns was knocked out by a KO punch from The Big Show when the referee’s back was turned and Cody capitalised by hooking the Shield member’s leg to pick up the 1-2-3. The rivalry between The Shield and The Rhodes Brothers was one of the best storylines of 2013, so it’s well worth checking out the finish to the tag match in the video below!